To those that do not agree on my bolted on rudder and swim platform arrangement I like to say the following. Yeas it is a complication. But KISS is not everything. Without complications we would still be driving around in T-Fords and using crank starts. Nature is complicated; every little cell is more complicated than the most complicated sailboat we can imagine. Nature proofs that complications do work. The Wright brothers did invent the airplane in their bicycle shop. The airplane is more complicated than the bicycle. Still the airplane can be a useful thing. But also with every complication you add there sure will be some detail or interference that mess everything up; something you did not think about. Reality is to complicated for an invention to work at first try. Do not give up. Fix it and get an improved product. To succeed you must give yourself plenty of time to test your invention in all kinds of different conditions. And if you cannot find a good solution to the problem kill your darling like writers do all the time. 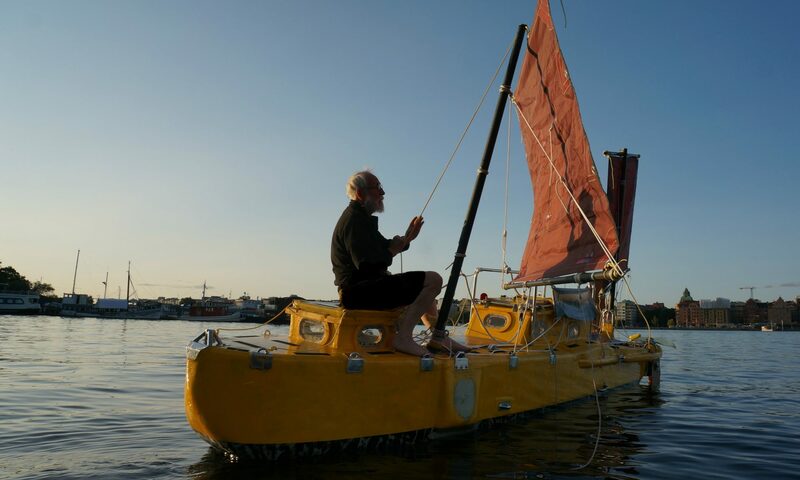 Yrvind Ten is an experimental boat and there will be many things that at first will not work. If I cannot fix it even after hard thinking I kill it and try something else. My intention is first to try her here in the Baltic. If that works out I intend to make a voyage from Norway to Grimsey, an small island just north of Iceland. It has been inhabited since Viking times. It is a cold and miserable place even in summer. Of course the bolted on swim platform is a complication. But at present it looks that its good points outweigh its bad ones. To prevent the aft extension to force the bow up I will give the twin rudders quite a bit of displacement – no law against that. I will give them a 0020 NACA section, a cord of 0.4 meter and a depth of 0.9 meter. That gives about 40 liters of added displacement far aft and should more than compensate for the weight of the platform and I think even help to reduce pitching. As for having rudders far back. Its simple mathematics the further back they are the more leverage you get and the more yaw damping. Think about them in this way. The peripheral speed of the rudders increases with the gyradius and the hardness of water increase with the square of the rudders speed and the rudder force increase also with gyradius. As for self-steerers if you can avoid them its good. I made my first ocean passage 1969 and my last one 2011. They were made without self-steering as well as the many ocean passages I made between them. I have succesfully crossed oceans in six very differnt boats without self-steerers. Self-steerers are cumbersome fragile things. My friend Matt Layden does not use them either. When he single-handed did win his first entry in The Water Tribe Race he came to the races destination one day before the second finisher. That indicates that sailing with out self-steeres dont have to be sloow. Do not misundrstand me. I am in favour of simple things but I also like progress.